Our 6 YAV choirs represent various stages in our choristers’ choral education. From ages 5 through to 35, YAV supports the musical growth and development of over 150 young singers. 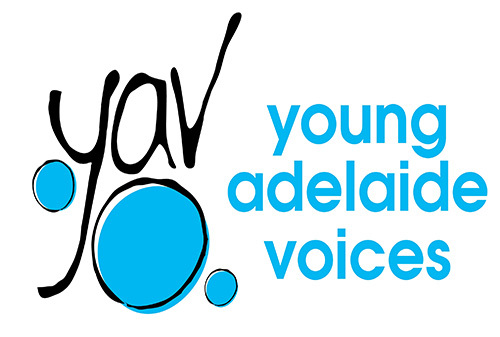 Young Adelaide Voices is a unique South Australian Choir School, catering for young boys and girls aged 5 – 35. This community based, not-for-profit organisation provides a top quality choral education within a friendly, positive and non competitive environment. We teach excellence in singing, performing and musicianship with music from all genres and eras and concerts for every choir, young and old! It’s exciting to hear how young choristers grow in skill and maturity as they progress through the choirs and hear how they develop not only in sound but in confidence and teamwork. These bonds are strong and the music and friendships they make in their years in YAV last a lifetime. Energy, enjoyment, excitement and involvement for all choristers accurately encapsulates the essence of YAV. Singing beautifully is obviously the main aim and focus of the Choir, but there are many components underpinning a beautiful choral performance. Our 6 choirs represent various stages in our choristers’ choral education. YAV has a flexible structure which allows choristers to study music appropriate to their different abilities, interests and experiences. Each choir group represents a stage of choral education based on learning to use the voice correctly, using Kodaly principles relating to aural awareness, musical theory, and sightsinging. Choristers are exposed to diverse musical genres, and they learn about a wide variety of composers, compositions and cultures. Regular assessments and placements according to age and ability ensure that individual needs are met and choristers progress systematically to the next challenge. Time set aside for Musicianship appropriate to all levels of knowledge, as part of weekly rehearsals. Facilitating group or individual vocal lessons on a rehearsal day and choral conducting for older choristers. Great importance is placed not only on world class vocal, choral and musical development of the choristers, but also on their emotional and social development. Time is set aside during rehearsals, workshops and camps to focus on group skills including co-operation, acceptance, active listening, and self discipline. Choristers feel a sense of ownership in the Choir and a responsibility for the progress of their choral and social education within it. YAV is an active, vibrant community with an emphasis on fun and fellowship within a supportive and caring environment. There is a wonderful spirit of co-operation and excitement in the many activities of the Choir – it brings out the very best in everyone! Parents’ involvement is welcome and our volunteer structure gives people the opportunity to meet others and feel real ownership of the Choir. Professional organisations which work with YAV speak highly of the Choir’s brilliant performances, its excellent organisation, exemplary team work and its friendly atmosphere. All these qualities seem to flow effortlessly given YAV shared vision of excellence and fellowship!